This booklet contains two essays: Four Sublime States by Ven. Nyanaponika Thera and the Practice of Loving-Kindness (Metta) by Ven. Nanamoli Thera. 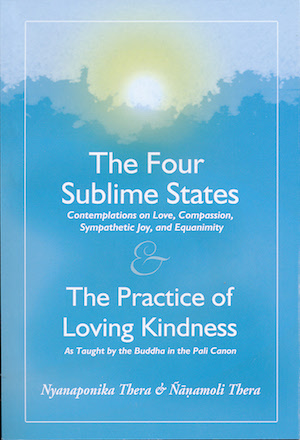 The four sublime states , known as the brahmavihara are the lofty mental states of love, compassion, sympathetic joy and equanimity. Ven. Nyanaponika gives a brief description of all four with a section of contemplation exercises for each. He concludes with a section on the inter-relationship of all four. Ven. Nanamoli's essay focuses on the basic brahmavihara of metta, translating for us in his lucid style the key passages from the Pali Canon in which the Buddha taught the practice of metta.